Listed simply as "R. A. Davis"
View their marriage certificate here! 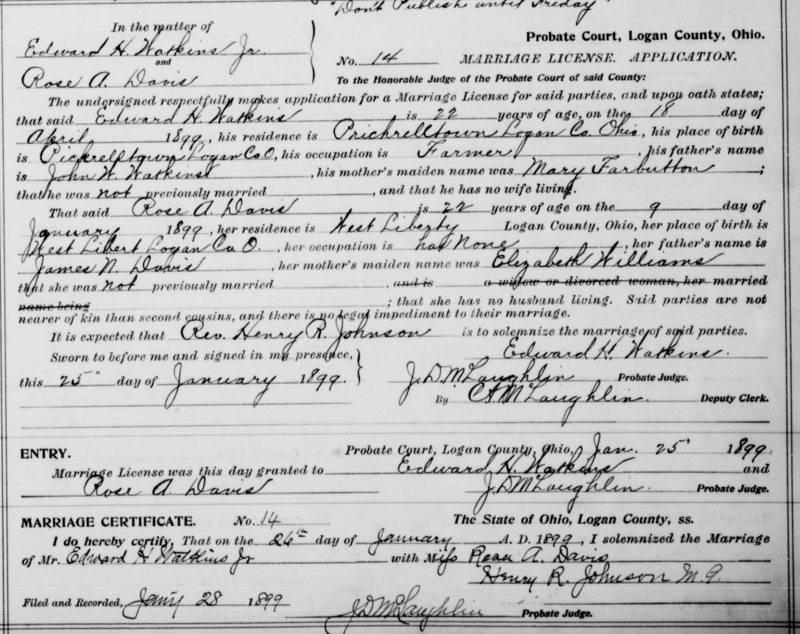 [S145] Marriage Records, Logan Co, OH Marriages 1899-1903, Vol I, Page 7. [S416] 1880 United States Federal Census, Monroe Township, Logan County, Ohio ED 121 Page 7 Dwelling 48. [S417] 1910 United States Federal Census, Monroe Twn, Logan County, Ohio ED 139 Page 8B Dwelling 159. [S415] 1920 United States Federal Census, Monroe Twn, Logan County, Ohio ED 200 Page 8B Dwelling 165. [S86] ua, Monroe Twn, Logan County, Ohio ED 46-22 Page 5A Dwelling 103. [S449] 1940 United States Census, 1940 United States Census., Monroe Township, Logan, Ohio, ED 46-27, Page 9A, Dwelling 178.